Violence will be at an all-time high on Saturday when Justin Gaethje and Eddie Alvarez step into the Octagon. Alvarez and Gaethje were once widely recognized as two of the best lightweights outside of the UFC, but their paths will finally cross at UFC 218. In a fight that pits two Top 5 lightweights against each other, Gaethje seems to be tapped for big things if he can pull out the win. There’s nothing not to like about this matchup. 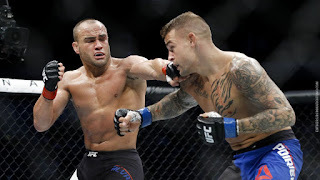 Alvarez overcame expectations after leaving Bellator as the champion, eventually finding his way to UFC gold, becoming the first and only fighter to hold both of those belts. Even though he dropped the title to Conor McGregor at UFC 205, Alvarez remains one of the toughest outs in the lightweight division. 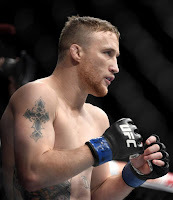 Then there’s the former World Series of Fighting champion, Gaethje. Like the WSOF itself, both Gaethje and his former colleague, Marlon Moraes, came into the UFC flying under the mainstream radar. That was until his bout against Michael Johnson at The Ultimate Fighter 25 Finale. Over just under two rounds, Gaethje and Johnson put on a fight that many will remember when it’s time to vote for the Fight of the Year in 2017. And many fans expect Gaethje and Alvarez to top it. But Gaethje has more at stake than an award for violent entertainment. A clear and dominant win over Alvarez would create a clear path to the UFC Lightweight Championship. McGregor holds the belt, and in many ways, is holding the division at ransom. While interim champion Tony Ferguson seems to be the next man tapped as the champion's opponent, there’s no telling what UFC President Dana White and promotional leadership will decide to do in order to chase the almighty dollar. So even though Ferguson has the longer UFC tenure, a Gaethje vs. McGregor bout brings much more cachet, and more potential for a bout that fans will thoroughly enjoy. Ferguson may be the interim lightweight champion, but he hasn’t shown that he has an ability to be a major draw for the organization. UFC 216 wasn’t considered a box office or pay-per-view success. He faced Kevin Lee in the main event, and the showcase reportedly struggled to hit a 200K PPV buyrate. 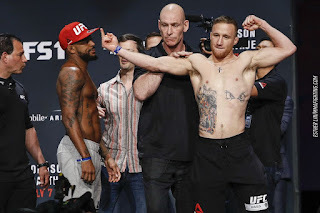 Gaethje hasn’t headlined a PPV yet, so the comparison isn’t available, but he has value as a champion that was bred outside of the UFC, coming into the promotion to challenge the champion of champions. The moment a fight between Alvarez and Gaethje was announced, the collective community of MMA fans began to salivate at the idea. That fight is now a few short days away at UFC 218. In many ways, Justin Gaethje stands to gain the most if he can come out on top this weekend. He can continue to cement his reputation as a purveyor of violence, and he’s positioned to become the fighter who will welcome Conor McGregor back to the world of mixed martial arts.